Please note that the dates for English and the dates for Spanish are different. Our Baptism Preparation Classes focus on the parents as the primary teachers of the faith in their families. Both parents and both godparents are expected to attend both classes. 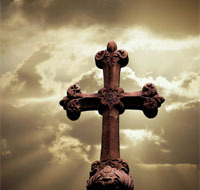 Beginning August 1, 2011, there is a $40 fee for the Baptism Preparation Class. In order to register for Baptism Preparation Classes, all information must be turned in to the parish office and payment made at least one week before classes are scheduled to begin. Children and youth over the age of 7 who have had little religious education are required to participate in the RCIA (Rite of Christian Initiation for Adults) as adapted for children and youth. Through this process they are introduced to the teachings of the Catholic Faith, basic Catholic prayers, and the sacramental life of the Church. At the end of the two year process, they are baptized, confirmed and receive their first holy communion. Please see the section below on the RCIA. As a Godparent, your role is to be an example to the godchild. You are called to reflect with your godchild the meaning of life of Catholic discipleship. Only one godparent is called for by the Roman Catholic Church. A child may have two godparents, male and female only. 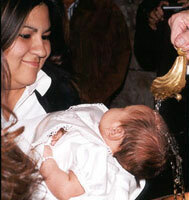 Godparents must be at least sixteen years old; not the parent of the child to be baptized (grandparents may be godparents); fully initiated Catholics (have celebrated the sacraments of baptism, confirmation and Eucharist); be Catholics in good standing in the Church; if married, be in a valid Catholic marriage; and be practicing members of the Catholic faith. Godparents must complete and sign the Godparent covenant as requested by the Diocese of Austin. First Reconciliation (Confession) and First Communion requirements can be found in the PDF document link below. They are also available at the church office. Please contact the office to find out if your child is eligible to participate in the First Communion Class. Los requisitos para las clases de la Primera Reconciliación (Confesión) y la Primera Comunión están disponibles para revisar. También son disponibles en la oficina de la iglesia. Por favor llame a la Oficina de la iglesia par informarse si su niño es elegible para participar en las clases de Primera Comunión. Confirmation requirements can be found in the PDF document link below. They are also available at the church office. Please contact the office to find out if your child is eligible to participate in the Confirmation Class. Los requisitos para las clases de la Confirmación están disponibles para revisar. También son disponibles en la oficina de la iglesia. Por favor llame a la Oficina de la iglesia par informarse si su niño es elegible para participar en las clases de Confirmación. 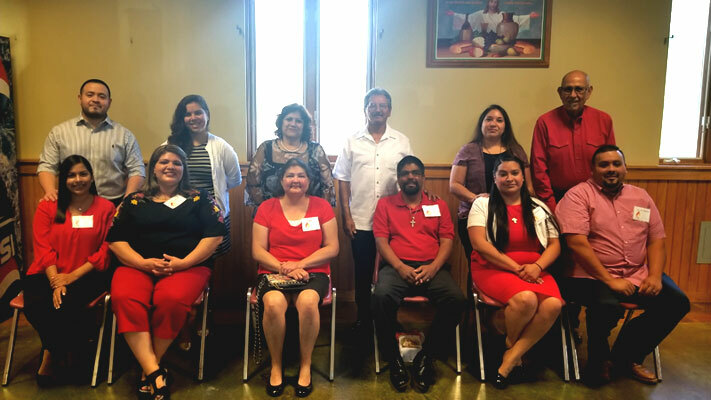 The Rite of Christian Initiation of Adults (RCIA) is for adults who seek to become Catholic through the sacraments of baptism, confirmation and Eucharist. It is also for those persons baptized in other Christian faith traditions who wish to become Catholic through a profession of faith and the sacraments of confirmation and Eucharist. Baptized Catholics who did not receive instruction in the Catholic faith and did not complete the initiation process may receive instruction in the faith and prepare for the sacraments of confirmation and Eucharist. 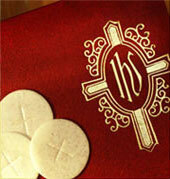 All sacraments are received at the Easter Vigil. RCIA begins in September and lasts through May. Registration takes place in the parish office beginning in August. Unbaptized persons must turn in a copy of their official (not hospital) birth certificate. Baptized persons must turn in a copy of their baptism certificate. Persons seeking full initiation in the Catholic Church must be living according to Catholic teaching in order to receive the sacraments. One important aspect of this pertains to marriage. The Catholic Church recognizes marriage as a sacrament of the Church. Persons who are civilly married, living together or married by common law must bring their marriage into the Catholic Church in order to be “in good standing” and receive the sacraments. Please contact the parish office as soon as possible to begin the marriage preparation process. Congratulations and many Blessings to our newly Confirmed Members! We pray that you remain close to Jesus Christ our Savior and continue in the path of Salvation! Marriage requirements can be found in the PDF document link below. They are also available at the church office. Please contact the office at 478-7955 at least six (6) months prior to your intended wedding date. Los requisitos para la preparación de matrimonio están disponibles para revisar. También son disponibles en la oficina de la iglesia. Por favor llame a la Oficina a 478-7955 no menos de seis (6) meses antes de la fecha deseable de su boda información.